I received 2 sets of the flats to go. The snakeskin gray and fleecy leopard. I was only able to try the fleecy leopard as the snakeskin were too small for my feet. First up will be the fleecy leopard since those were the ones I could wear. I love how soft they are and how easy they are to slip on. They are great to wear around the house if I need to toss something on my feet quickly. I love that I can put them in my bag in case I decide to wear my heels to work I can grab these when my feet begin to hurt and I need a break but can't go barefoot. The sole is ridged to help keep your grip without sliding. The snakeskin first opinion is they don't feel as well made as the leopard. The material attempts to be more leather like but ends up feeling like as plastic paper. I was amazed at how different these felt from each other. It felt to me that the leopard were better made in the long run. I am sending these to Connie as they are her size and we will add her thoughts in once she has them and has a chance to try them out. I love how portable these are and easy to carry in their own bag. If it were I, I would choose the plain black or silver as they match everything. These aren't meant to be worn as a regular shoe but as a release from the pain of heels or other dancing shoes in a place where going barefoot would be frowned upon. These are perfect for a bridal party to have on hand. At the end of the night most women end up barefoot because dancing in heels is just too much! Don't go bare go kushy! These retail for $9.99 a pair and can be purchased at Kushyfoot's website. I think it's odd that they're both made by the same company, yet such different quality. These would be great for me, I have plantar fasciitis, so even though I love wearing heels and boots, they kill my feet after a time. I'd love to be able to have something in my bag to slip into for some relief. Great price on them too! 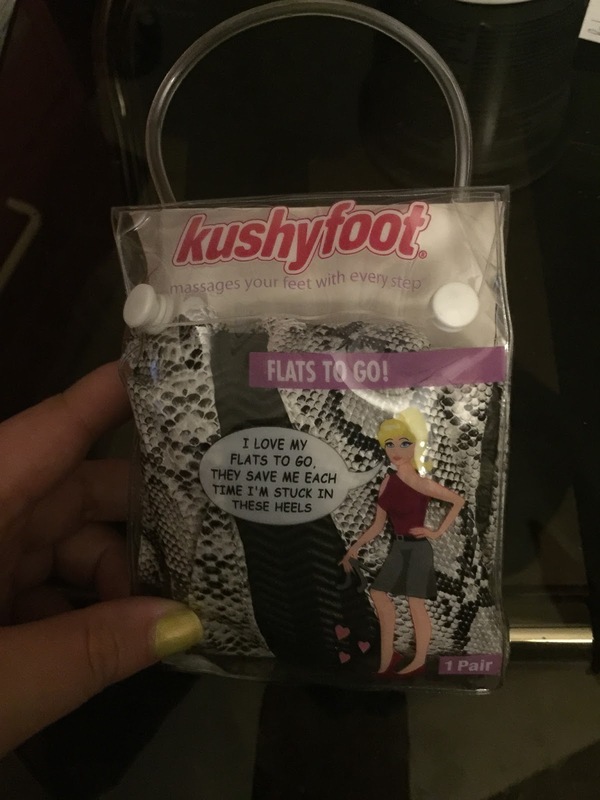 These sound great especially for those working moms on the go who are rushing around the house trying to get everyone off to school and heels would be too uncomfortable.